Under sunny skies, a woman strolls below the railway bridge that extends across the landscape in Sault Ste Marie, Ontario in Canada. 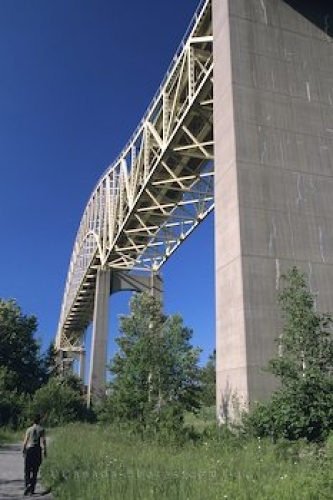 When wandering below this railway bridge in Sault Ste Marie in Ontario, Canada and a train passes overhead, the roar of the train is a fascinating sound. This incredibly constructed railway bridge is a unique piece of architecture that is used daily by trains. Train Bridge, City, Sault Ste Marie, Ontario, Canada, North America. Picture of a woman walking below the railway bridge in Sault Ste. Marie in Ontario, Canada.